What Does Microsoft Really Want from Yahoo? Google: Bidding for Yahoo or Driving up Cost for Microsoft? Microsoft CEO Steve Ballmer feels intensely fortunate that his company's $44 billion bid for Yahoo back in 2008 never materialized. "Sometimes you're lucky," he said with a smile at Web 2.0 Summit, responding to a question from conference co-chair John Battelle. 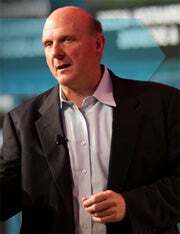 Careful not to offend his search market partner, Ballmer put his comment in context, saying that any CEO would feel grateful for not making a major acquisition in the months prior to the global financial collapse that started in the second half of 2008. "We would have been closing [the Yahoo deal right after] Lehman Brothers," Ballmer said, referring to the historical collapse of one of the largest financial institutions in the U.S. Microsoft made its offer for Yahoo in early 2008 and withdrew it several months later. Of course, Yahoo has continued to struggle since 2008, when Microsoft made its acquisition bid, and this year Yahoo's fortunes have taken a more steep downturn. CEO Carol Bartz was fired last month, and this week the company announced that CTO Raymie Stata has been replaced, as the company struggles to emerge from years-long financial and technology funk. Although Ballmer made a point of saying that "there are a lot of great things about Yahoo" and that he's very satisfied with Yahoo as a search partner, it's clear that Yahoo would be worth much less than what Microsoft offered for it in 2008. Since the ouster of Bartz, there have been unconfirmed rumors that Yahoo's board has been entertaining discussions about selling the company to AOL or Microsoft, and that Yahoo co-founder Jerry Yang has tried to round up investors to acquire the company and take it private. Ballmer also expressed satisfaction with the progress of Microsoft's Bing search engine in the past three years both in terms of usage and of technical improvement in areas like result ranking and relevance, as well as user interface. Although Google remains dominant in search, Bing's progress "sets the stage for reinventing the category," Ballmer said, indicating that Microsoft harbors hopes of eventually making a run at Google's leadership position. Asked whether Microsoft plans to launch a social networking site in the style of Facebook and Google+, Ballmer said Microsoft views online social interactions as varied in nature, with different tools for different uses. For example, Microsoft has products that play in the social space, including recently-acquired Skype, which he views as tailored for interacting with the people one is closest to, and its XBox gaming console, which allows for people to play over the Internet. As for workplace cloud applications, Ballmer said Microsoft is "all in, baby," competing head-to-head against Google in the segment for communications and productivity suites, where Microsoft's Office 365 goes up against Google Apps and is "winning, winning, winning." This market for communications and productivity applications is the most mature in terms of adoption by businesses, while other areas aren't at that level yet, such as cloud-based platforms and line-of-business software, he said. Ballmer said Microsoft continues to work hand-in-hand with hardware manufacturers to make sure that Windows is present and optimized for a broad variety of devices, including desktop and laptop PCs, smartphones, tablets, and others.